After the transition to digital television on February 17, 2009, television stations in the United States will move to their final channel allocations. A majority of stations will be on UHF (channels 14 to 51), rather than VHF (channels 2 to 13). Many people will need a UHF antenna if they want to continue receiving their current stations. I previously mentioned two good indoor HDTV Antennas. But an outdoor antenna might be your only option if your stations are weak. Two good outdoor UHF antennas are the Channel Master 4221 Mid-range outdoor rooftop UHF antenna and the Channel Master 4228 Long-range outdoor rooftop UHF antenna . The Channel Master 4221 is a mid-range antenna, with a stated range of 45 miles. This type of antenna design is called a bowtie dipole, easily understandable if you notice the four “bow-ties” visible. The main part of the antenna (excluding the pole) is around two feet wide by three feet high, considerably smaller than any combination VHF/UHF antenna. Despite the smaller size, UHF reception is much better than any combination antenna can deliver. On the other hand, the 4221 has no VHF reception at all. Although the stated range is 45 miles, it is important to remember that range is very dependant on your location. You might achieve over 45 miles easily in some places, but struggle with 20 miles at others. But if reception is at all possible, then the 4221 is one of your best choices. 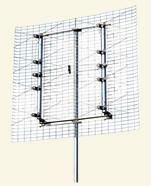 The Channel Master 4228 is a long-range antenna, with a stated range of 60 miles. It is essentially two 4221’s placed side-by-side and connected together. Not surprisingly, it is around twice as wide as the 4221, twice as heavy, and twice as expensive. In addition to greater range, the 4228 is far more directional with a much narrower “beam width” (around 15 degrees for the 4228 versus 45 degrees for the 4221). A directional antenna can be good in that it can reject stations located too close to each other. It can be bad in that aiming must be more precise, often requiring a rotator. One curious feature of the 4228 is that it has surprisingly good reception of high-VHF (channels 7 to 13), even though it is the wrong type of antenna for VHF. This is well known, and good high-VHF reception is apparently just a quirk of the design of the 4228. But if your only VHF stations are high-VHF, this could mean that you don’t need a separate VHF antenna.